The new year has begun and people across the world have committed to healthier lifestyles. Now is the time to commit to healthier roadways too. Putting your road on a diet can do more than make you slimmer this year- it can save lives. Wondering what a road diet is? 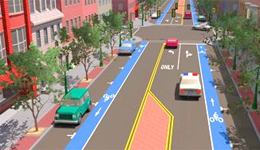 Road diets are tools used by traffic engineers as part of a traffic calming plan to make streets safer and prevent accidents. Learn more about what a road diet is, how you can slim your roadway down, and whether a road diet is right for you. Not ready for a road diet? Healthy streets go beyond just diet- learn techniques for safer and more complete streets in our January Traffic Calmer. PreviousPrevious post:Do you Plan to Stay Safe this Holiday Season?NextNext post:Can your car keep you and those around you safer on the roads?